According to the USDOE, homeowners can save 15-20% of their monthly heating and cooling bills by utilizing green building methods and products. At Capital Construction we hear this message and regard energy savings as an integral part of building green. We take a whole house approach to building and consider how all the parts of the house fit together to create a more energy efficient, long lasting and healthy home. Take windows for example; windows are the most expensive component of a house. At Capital Construction we ensure that you get the most from your investment by designing for functionality as well as aesthetics. A room with a clear view of the outdoors puts one in touch with the natural environment and brings the outside in. A naturally well lit room enhances the visual appeal of any space and invites people in. We achieve this by strategically placing and sizing windows so that one can readily appreciate the natural features of a building site from almost any location within the house. By doing so we reinforce our connection with our natural surroundings and create a space where people want to be. We all know that natural light makes us feel better and heightens our sense of comfort. If your site lends itself to a south facing orientation, we locate the family room and public spaces accordingly with larger and more abundant window openings to increase natural light and the feeling of wellbeing that comes with it. Did you know that by increasing the amount of natural light in your home one can reduce chronic respiratory diseases, allergies and asthma related symptoms? Sunlight is a powerful healer, germ killer, antidepressant, and relaxer. Aside from the obvious benefits that come with increased exposure to natural light, by capturing the sun’s energy we reduce our dependence on fossil fuels and shrink our carbon footprint. A naturally well lit home is not only healthy for the people who live in it, but healthy for the environment as well. 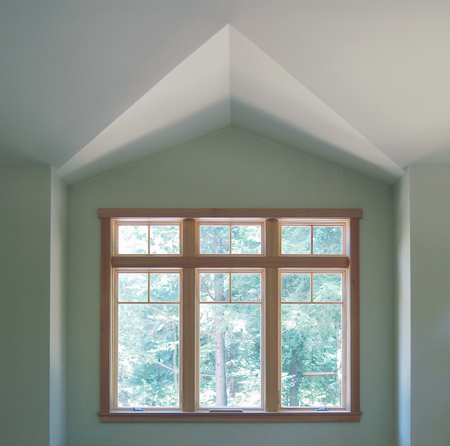 Utilizing natural light makes a house a more healthy and pleasant place to live. While the upfront costs may be higher than some traditional building models, the benefits from design, comfort, health, and long term savings make building green the smartest choice. Do you have questions about building a new home or remodeling? Capital Construction is a general contractor and certified green home builder working with homeowners in Saratoga Springs, and the surrounding northern Saratoga and Southern Warren County areas of upstate New York. Please feel free to use our web site contact form, or call us at 518 884-4555 to ask a question or schedule a consultation.